Beer Market at Clarke Quay – Buy Low Drink High! First of all, a very great thank you to TheSmartLocal for the invitation to the makan session and a great thanks to Beer Market (Chef Steven and Operation Manager Charlie) for hosting us. It was a crazy rush during lunch hour but it is a great session. It’s nice meeting up with Bryan from TheSmartLocal, Tony from JohorKaki, Melicacy and Bon Koh from sethlui.com. Beer Market had been around for a couple of years at Clarke Quay for and I remembered them most for their fluctuating beer price accordance to their BMX (Beer Market Index). The price of their beer changes according to demand. If a certain brew is not ordered in the last 30 minutes, the price of this beer will drop, and on the other hand, if it’s really popular, the price will go up. Keep observing their TV screen for the best-priced beer and general guide is – Buy Low, Drink High. And this is possibly the only place in Singapore where one prays for a market crash. BM Rojak Platter ($ 39.90+). Good enough for 4-6. Apart from their atypical manly beer, Beer Market also offers fruit beer like North Taiwan Lychee Beer, Fruli Strawberry Bee and Matso Mango Beer. 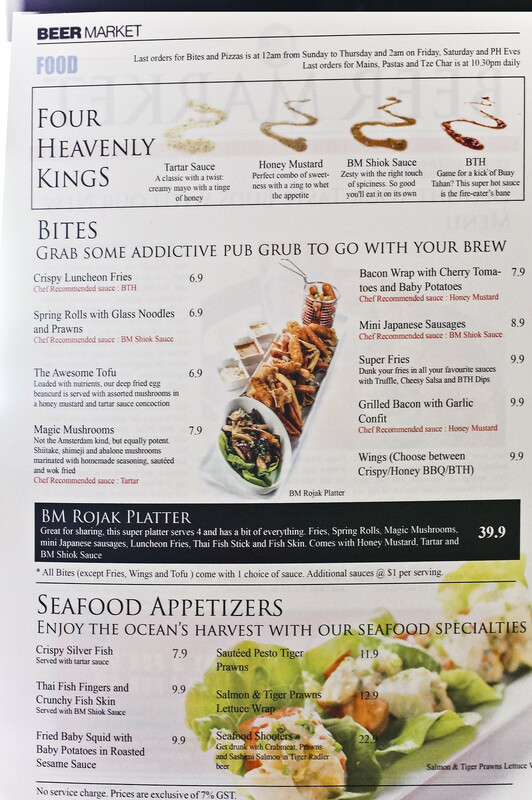 They just launched a new menu in March 2014, which they have some interesting items that incorporate a local twist such as salted egg seafood pizza and chicken rice pizza and seafood in shooter glass dunked in beer. 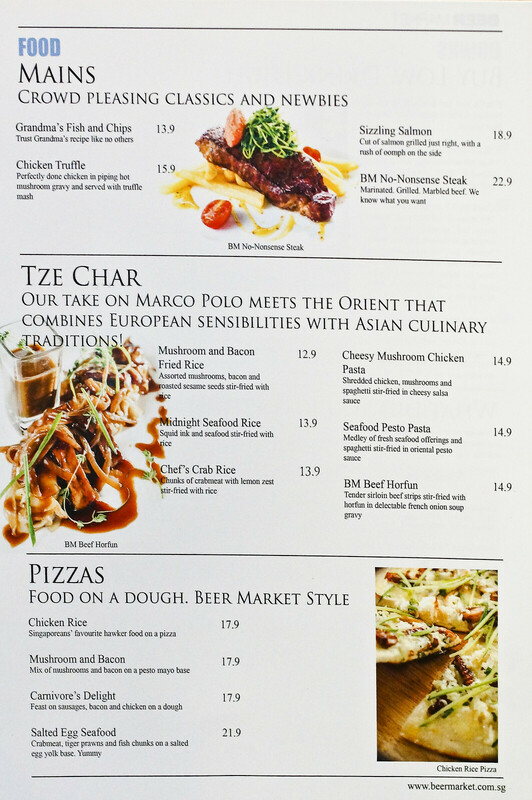 The description of their no-nonsense steak ($22.90+) reads “Marinated. Grilled. Marbled Beef. We know what you want” . I wasn’t expecting much from a steak that did not mention the type and cut of the steak despite of how they described their steak on the menu. But in fact, there are indeed traces of marbled texture in their No-Nonsense Steak and that comes as a delight for me. 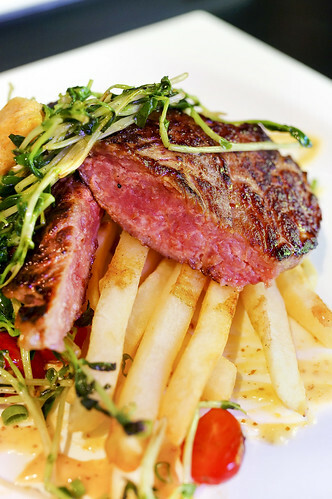 The exterior of the steak is grilled to moderately crisp and slightly charred for a delectable appearance while the steak remains moist and tender inside. The chef specifically mentioned that the steak is to go with their butter. 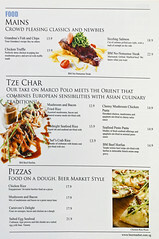 Hopefully steak of similar quality can be served to every patrons in Beer Market and not a one-off thing. I thought that the main lead of this dish is not the chicken chop but for it’s sauce and truffle oil sprinkled mash potatoes. Beer market is considerably generous with the amount of truffle oil used on this dish. The chop taste very proper, tender, nice, like how a chicken chop should be. 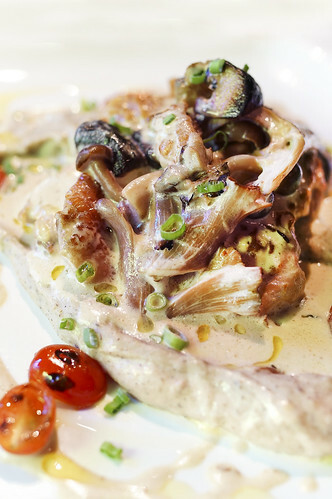 The portion of mash potato is drenched in a good volume of mushroom gravy and ensures you have enough sauce to last you to the last mouthful of mash potatoe. The price is pretty reasonable at 15.90+. I have no complain for their chicken chop, except the presentation can be better. 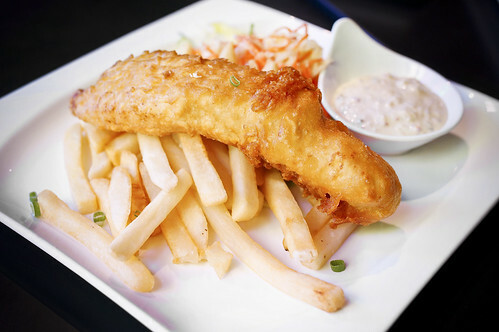 I can’t even spot the chicken chop easily when it’s served. It’s all covered by sauce, mushroom, onions and it’s like all mashed up. 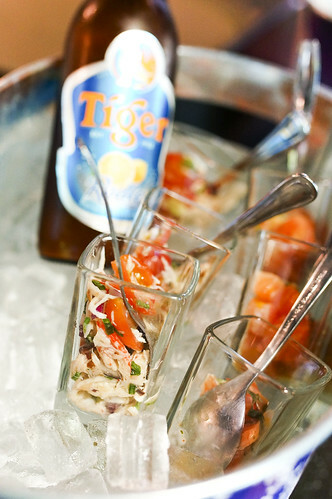 It cost $22.50 for a bottle of Tiger Radler with six glasses of Shooters (2 prawn, 2 salmon and 2 Crab meat). Tiger Radler (with only 2% alcohol) is then added into the glass to be consumed together. Tiger Radler taste more sweet with a tinge of lemon and I suppose that is why Beer Market decided to pair it with food instead of regular beer, which is evidently much more bitter. 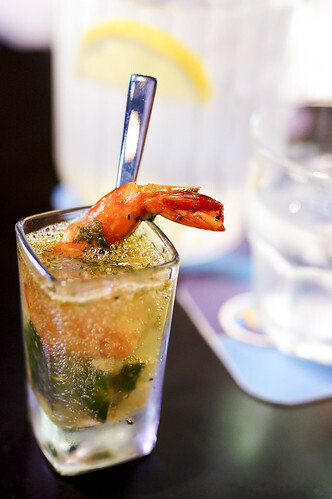 Generally the Tiger Radler adds a refreshing bitter lemon taste into the three kinds of seafood shooters. It works very well with salmon sashimi, OK with the prawn with cucumber and not as good for the shredded crab meat and tomato. The taste of beer and lemon overpowered the thinly shredded crab meat and I can’t taste too much of the crab. The cold tiger prawn is good. It’s really fresh and juicy. The quality of Salmon is not bad. It’s rather fatty with a distinct fragrance of the salmon fat. 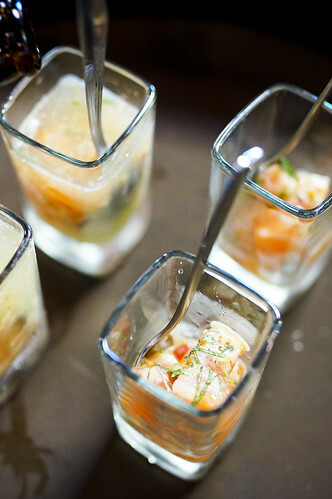 The salmon sashimi is lightly marinated in orange juice and whiskey and it goes well with the slightly sour lemon beer. 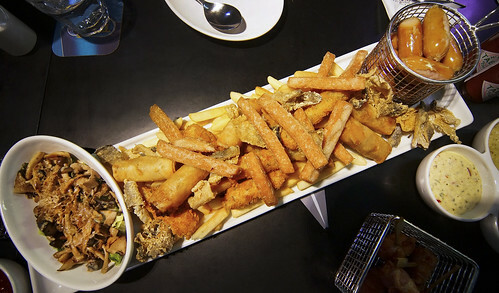 BM Rojak Platter ($ 39.90+). Good size, can serve 4-6 people. 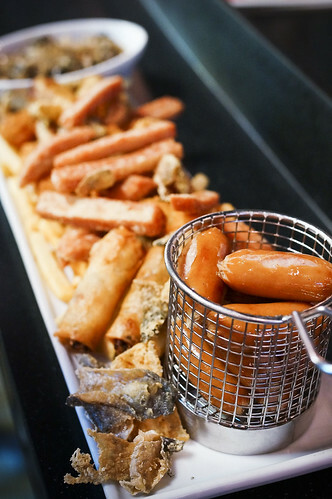 Comes with fries, luncheon meat, Japanese sausage, fried fish skin, spring roll, stir-fry mushroom and thai fish stick with three kinds of dipping sauce – Honey Mustard, Tartar Sauce and BM Shiok Sauce. Love the Shiok Sauce. 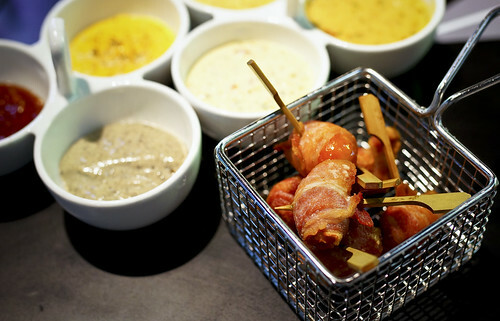 The platter is good to go with beer. I had to rush off after their main course and didn’t get to savour their chicken rice pizza (i thought that will be pretty interesting though). 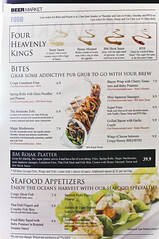 The first thing I noticed about Beer Market’s menu is for it’s price. It looks pretty reasonable comparing to food price of some other bars. 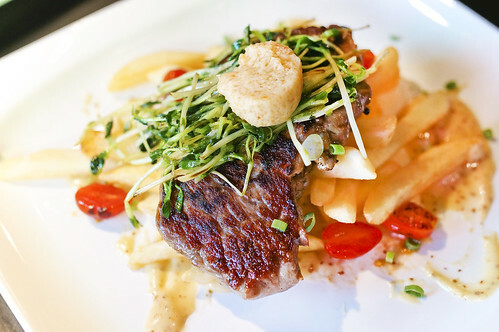 The food quality is decent and I like their steak the best among all. I also like how well-spaced the tables are and won’t really feel all cramped up. It’s a rather good place for colleagues to chill (i had my colleague’s farewell dinner there previously) and to de-stress after a hard day at work. And daily live band? Yeap, that should works for me too. I had been seeing a lot of Tonkotsu Kazan Ramen instagram posts recently and i just happen to pass by this ramen restaurant at Liang Court so i decided to try it out. 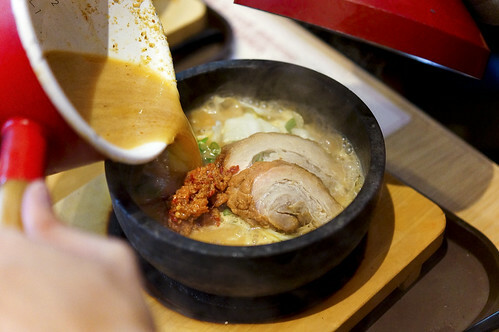 Tonkotsu Kazan Ramen originates from Osaka Japan and they specialise in Hot Stone Ramen and Rice. Hot stone rice typical range from S$10.00 to S$12.00 and a hot stone ramen cost S$15.00 for a small and S$18.00 for a big size. Tonkotsu Kazan ramen offers a new ramen dining concept. 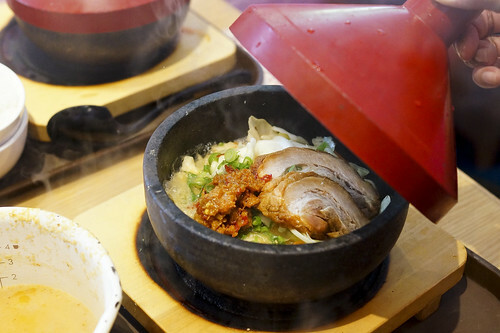 Instead of serving ramen in traditional plastic bowl, they serve their ramen in hot stone bowl. The stone bowl is preheated to 300 degree Celsius and the waiter pours the Tonkotsu broth into the hot stone bowl right in front of my eyes. 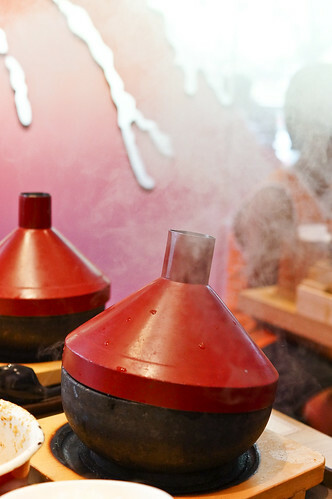 The waiter then covers the stone bowl with a red cylindrical-shape lid that looks like a volcano and let it cook for a minute. 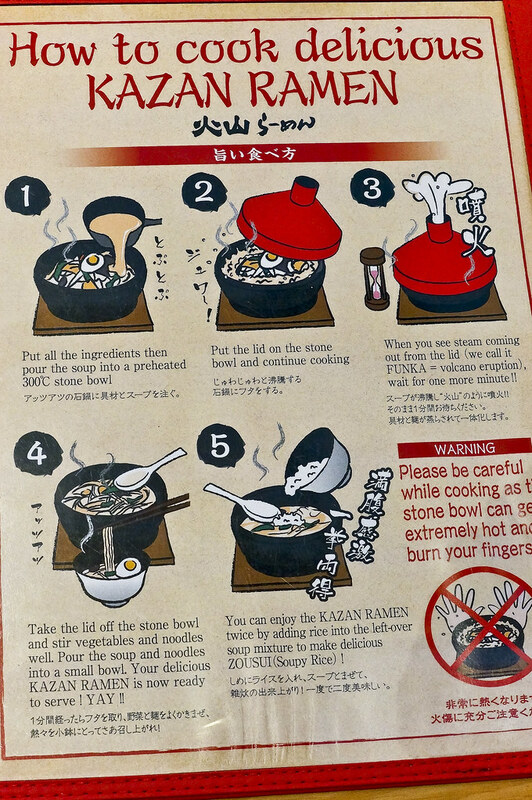 As the soup sizzles in the hot stone bowl, lots of steam is release through the top opening of the lid like a “volcanic eruption”. Probably the lid is use to prevent the boiling broth from splattering and it does not enhance the ramen taste in any way but is entertaining to look at during the one minute wait. 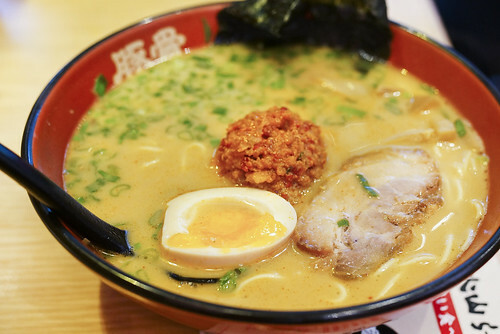 Every order of Kazan Ramen also comes with a bowl of rice to be added into the broth after finishing the ramen to enjoy the broth a second time. Their signature kazan ramen comes in four flavors – Kazan Shoyu, Kazan Curry, Kazan Karamiso and Kazan Kaisen Shio. As i always have a liking for strong base, i ordered the Kazan Karamiso and Curry ramen. A small Kazan Kara Miso Ramen cost me S$15.00++ and i think this is good enough for two people (if you are not the super big eater kind) as apart from the noodle, it also comes with a bowl of rice. 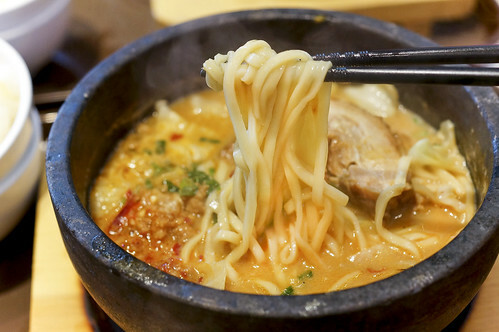 What i love about this ramen is – The broth and noodle remains piping hot for the whole time due to the hot stone bowl! I am a fan of bean paste stuff, anything with bean paste, so this spicy bean paste miso ramen had me pawned. 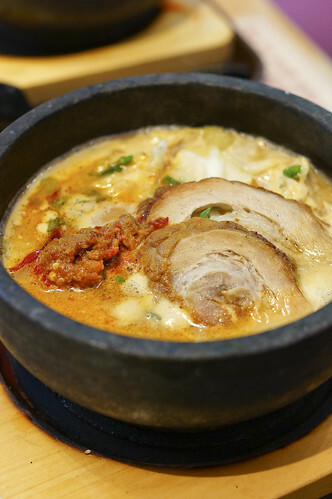 The soup broth is exceptionally flavorful with the added minced meat and i am loving every mouthful of the soup. On the other hand, the Char Siu is rather ordinary, a little dry, OK, as i had better ones before. Tonkotsu Kazan ramen use a thicker kind of ramen that looks a little similar to our flat noodle used in our Lor Mee but with a very different texture. The ramen’s very chewy, and taste a little like udon, but less soggy. The heat from the piping hot stone bowl made every bite of the ramen and every mouthful of the Tonkotsu broth really enjoyable, especially during this cold, rainy monsoon season. I had a lot of Japanese curry rice or curry udon in Singapore but not so much of a curry ramen. As the curry sizzles over the bowl of hot stone, the curry fragrance filled the air (and probably some on your shirt too LOL). Taste wise, I thought the curry taste can be a little stronger, or spicier. Probably it’s because i am comparing this with a typical plate of Japanese curry rice. Overall this is not bad but i prefer the Kazan Karamiso Ramen. I am not going to mention much on the soggy fried chicken as it’s rather disappointing but i thought the rice still can make it. Personally, i will not order the fried chicken again but there’s other choices like prawn and sausage. Unlike their noodle, Tonkotsu Kazan Ramen use a thicker kind of curry for their rice, which coats beautifully over the rice as i mix the rice and curry over the hot stone bowl. The end product would probably be a curry hot stone fried rice with the Japanese curry infused into every grain of rice. Like our Singapore claypot rice, some rice at the bottom part will be scorched and it actually made the rice taste even better. Those who love crusted burnt rice (锅巴) will know what i mean. 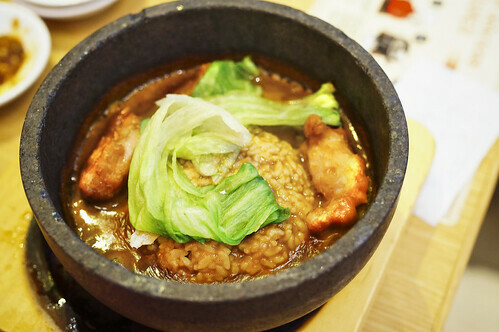 The current closest thing is Pepper Lunch’s Sizzling Curry Rice ranging from S$12.00 to S$14.00. Probably Pepper Lunch’s meat is better but i prefer Tonkotsu Kazan’s rice. This curry rice is not bad but not the priority in my to-order-again list. I ordered Tonkotsu Kazan Ramen’s Coconut Milk and Banana instead of the Ice Kazan, which apparently is their signature dessert, as i was too full from having the Kazan Ramen. 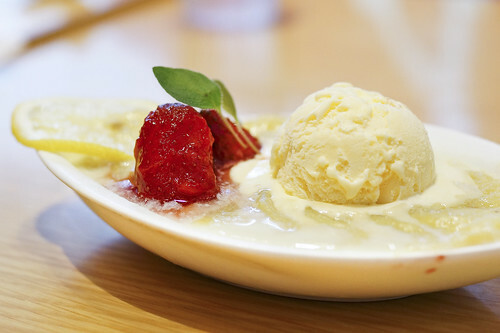 I think the banana was baked or oven heated before topping it with coconut milk, vanilla ice-cream and strawberries. Banana is OK, ice-cream is OK, coconut milk lacks coconut taste and taste like sweet milk and strawberry is disappointing. The core is still frozen and exterior is very soggy. Probably it’s because they use frozen strawberries instead of fresh one. Not exactly worth the $6++ IMO. Maybe i will try their Ice Kazan next time after looking at the mouth-watering photos from RubbishEatRubbishGrow and SethLui‘s blog post. Some say that the Kazan “Volcanic Eruption” is a gimmick and i do agree that Step 1 to Step 3 (Pouring of soup in the hot stone bowl > covering the bowl with lid > letting it simmers for a minute with the steam flying in all directions) can be done in the Kitchen but probably it adds a little more fun into the overall dining experience. 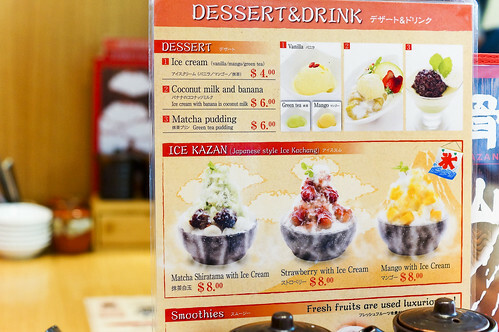 Among the dishes i tried, i am most satisfied with the Kazan Ramen series and probably will return for that, and to try out the Ice Kazan dessert. The price is pretty reasonable if the Kazan Ramen is to be shared by two pax. 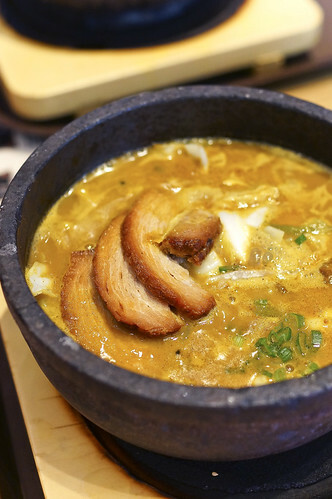 As for the rest of the dishes like the Curry Rice and the non Kazan series ramen, i think they are not attractive enough for me to specially make a trip down to Tonkotsu Kazan Ramen for them.